While Teen Mom 2 star Jenelle Eason seems to be more and more isolated from her friends and family after moving to The Land with husband David Eason, there is one relationship that seems to be going surprisingly well — the one with her mother Barbara Evans. After Jenelle and Barbara had what looked to be an irreparable falling out last season, mostly centered on Barbara’s dislike of David, the two have recently been hanging out together in some very casual settings! Back in September, Jenelle shared photos of her with her mom enjoying a “a cute breakfast with a cute little lady,” as she described it. And earlier today, Jenelle posted a photo with Barbara and revealed that the two were doing yoga together! “#MotherAndDaughter yoga class today!” Jenelle captioned the image. 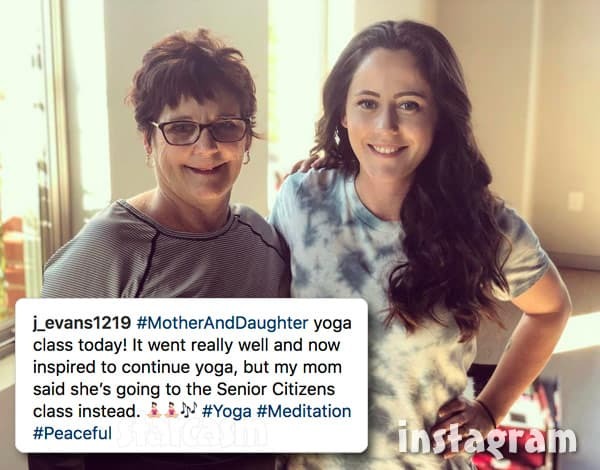 “It went really well and now inspired to continue yoga, but my mom said she’s going to the Senior Citizens class instead.” Jenelle added a couple yoga emoji, some music notes, and the hash tags #Yoga, #Meditation, and #Peaceful. In addition to the photo, Jenelle also shared a brief video in her Instagram story in which she and her mom were in the front seat of an SUV as Jenelle joked that they were filming with stains on Barbara’s shirt. Barbara laughed as Jenelle filmed the MTV cameras mounted on the windshield. In case you missed it, Jenelle worked out a deal with MTV to return for another season of Teen Mom 2, but the network refused to back down on their demands that David Eason not be filmed or be on set. Given that David is such a huge part of Jenelle’s life, it makes sense to assume that her agreeing to film with Barbara was part of the deal that allowed her to come back. Anyone who has watched Jenelle over the past decade must know that faking being cordial while hanging out with Barbara would have taken a monumental effort on her part! Perhaps too monumental. I can imagine her awkwardly faking a couple scenes, but it seems she has genuinely welcomed her mom back into her life to some degree — which deserves some praise. What do you think? Did Jenelle and Barbara genuinely bury the hatchet? 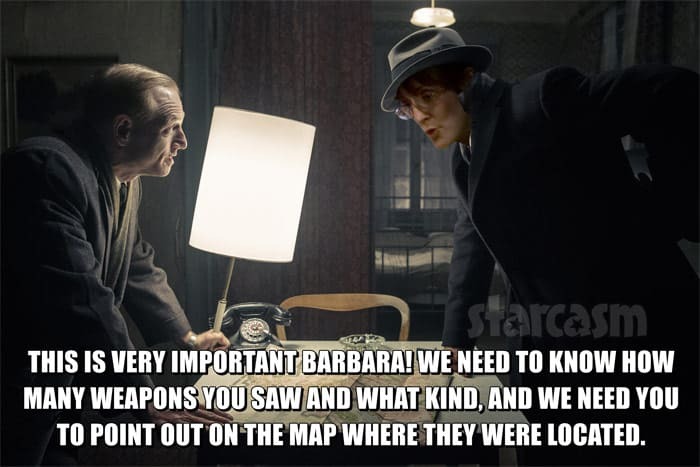 And do you think Barbara could ever be OK with David? QUESTION: Have you ever thought about deleting social media? You and David don’t deserve the ? y’all get. JENELLE: Makes us thrive and keep going ? QUESTION: Why do you keep your feud with Kail going? JENELLE: She’s just evil and can’t be trusted. ? ?‍♀️ This is why me and Bri get along so well… She’s not fake at all and never has turned her back on me. QUESTION: If you could go back and tell your younger self something, what would it be? JENELLE: Stop hanging out with the wrong people!!!!! ??? QUESTION: Will you ever get more land and a new house or are you set for life now? JENELLE: Ever since driving across country we’ve been very curious about land in other states… But IDK just dreaming LOL. I would keep this house and land tho.. ? QUESTION: You a fan of Tekashi69? JENELLE: Not really LOL. I rather be a fan of people who inspire me to do better… He seems like trouble. 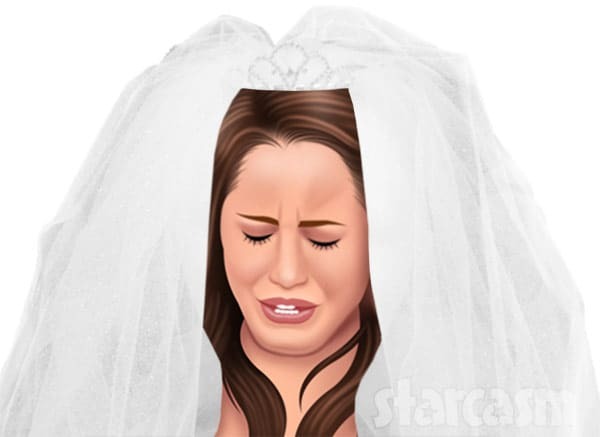 Jenelle Evans cancels her wedding after fight with David Eason!